On the occasion of International Women’s Day on March 8, 2019, Technology Empowering Girls (TeG) was launched in three districts of Telangana in an effort to end the gender technology gap and empower women and adolescent girls to create innovative solutions to advance equality of their lives and in turn their communities. TeG is an initiative of NASSCOM Foundation and supported by the Information Technology Department of the Government of Telengana. Implemented by Digital Empowerment Foundation, TeG is hosted by the Directorate of Public Libraries of the Department of School Education under the Government of Telengana. 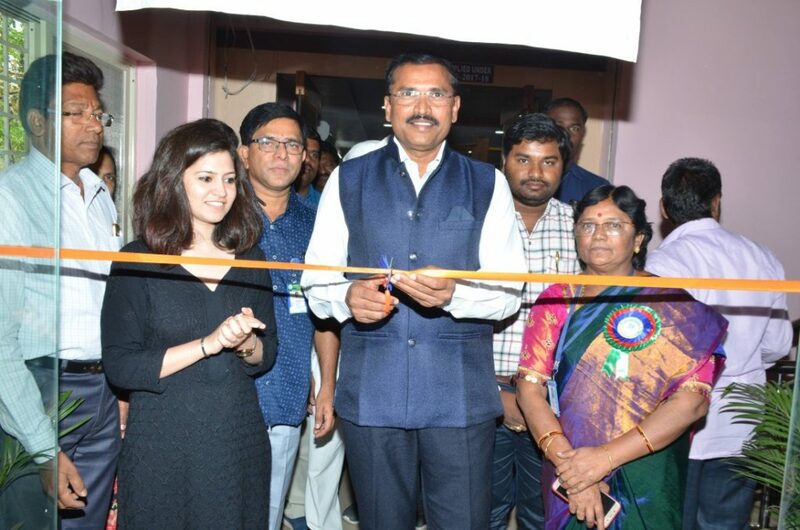 The launch of the initiative was organised at Kamareddy District Central Library amidst a roaring thunder of claps from 300+ women community members in the esteemed presence of the chief guest and Kamareddy District Collector Mr. Satyanarayana and his wife Mrs. Gangabhawani. Mr. Satyanarayana emphasised on the importance of women in our society and how digital enablement of women can lead to digital enablement of the larger society. Emphasising on the need to ensure highest quality of education for girls and women of Telangana, he pointed out that digital literacy has the potential to impact and improve education, health, finance, livelihood, governance and even personality development. Others present for the launch included Head of the Department of Integrated Child Welfare Ms. M Radhammam, Additional Defence Research and Development Organisation Mr. Sudheer, Senior Official from the Department of Backward Class Welfare Ms. Jhansi, Kamareddy Project Officer of Reliance Foundation Mr. Rajesh, and Deputy Manager Communications at Digital Empowerment Foundation Ms. Udita Chaturvedi. Secretary Kamareddy District Central Library Mr. Suresh Babu, who has been a pillar of support in the run up to the launch of TeG in Telangana, congratulated the consortium that’s behind the TeG programme and wished the trainers luck. Under this initiative, Digital Empowerment Foundation will build the digital capacities of 300 girls and women across Kamareddy, Mahabubnagar and Vikarabad districts of Telangana in an effort to digitally empower the women and girls of the state and broaden their livelihood opportunities. This will be achieved through an innovative 42-hour digital literacy course that trains women and girls in the knowhow of ICT, use of technology for information access, use of digital tools for information dissemination, and leveraging technology for education and livelihood. Aligned with the national vision of Digital India, TeG has three key objectives. These are aimed at empowering girls in technology, empowering girls through technology, and repositioning public libraries into vibrant and inclusive knowledge spaces. The launch event also attracted enough national and local press attention, with stories being published in English and Telegu dailies for the next couple of days. Prior to the launch date, a training of trainers (ToT) was organised for three women from Kamareddy, Mahbubnagar and Vikarabad who were identified based on their knowledge of computers, skills to teach a group of students, ability to adapt, sensitivity to mobilise community members and passion for the role. Over the period of next five months, each of the three trainers will take two batches of students per month. Each batch will include 10 students, who go through the 42-hour curriculum. By the end of five months, 100 students would be trained using a combination of TEG curriculum and START toolkit.